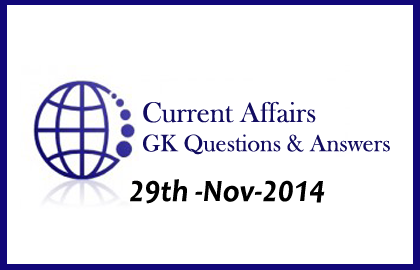 Current Affairs and GK questions Update-29th Nov 2014 | IBPS/SBI/PO/Clerk Exam Preparation: Current affairs and GK questions about the country and world are listed here. Candidates those who are preparing for IBPS/SBI/PO/Clerk exam and all other Banking exams can use these questions. 2).Deodhar Trophy is related to which of the following games? 3).PV Sindhu has won Macau Open Grand Prix Gold Badminton Title 2014 by defeating _______ in final? 4).What is the name of the committee that has submitted its report on teacher education? 5).In which language Malaysia has released its new National Day Song? 6).How many industries join together to form Core sector of India? 7).What is the name of the Indian who has won the Asian Football Confederation Hall of Fame Award 2014? 8).Jarbom Gamlin the former CM of _______ has passed away recently? 9).In NCTE, here ‘T’ stands for? 10).Where did UN climate Negotiators meet to try to advance talks on a new global agreement?